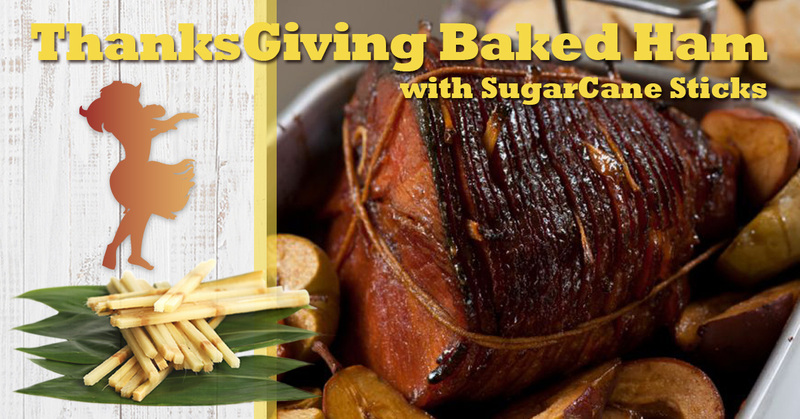 ThanksGiving Baked Ham with SugarCane RECIPE! Line a shallow baking pan with parchment or waxed paper. Insert the sugarcane sticks into the ham at 3 to 4-inch intervals. Tie the ham, using kitchen twine, horizontally and vertically, like a package, to hold it together. Place it on a wire rack in the baking pan. In a mixing bowl, combine all of the glaze ingredients together except for the mustard and water. Mix well. In a small bowl, dissolve the mustard in the water, then add to the spice mixture. Blend well. Brush the entire ham with the glaze, coating it evenly. Wash, core, and halve the fruit. Place all around the ham. Baste the ham a second time and baste the fruit with the glaze. Bake for 45 minutes. Baste the ham and fruit again. Bake another 45 minutes. Remove the ham from the oven and let it rest for 5 minutes. Remove and discard the string and swizzle sticks. Serve the apples and pears on a platter with the ham. Serve everything warm or at room temperature. Get your Organic SugarCane Sticks at our SHOP.